As I am taking a break from working on our house I started thinking about our garden this coming spring and how I would plant it. This will be the first time we have planted a garden here and will have to break sod to do it. 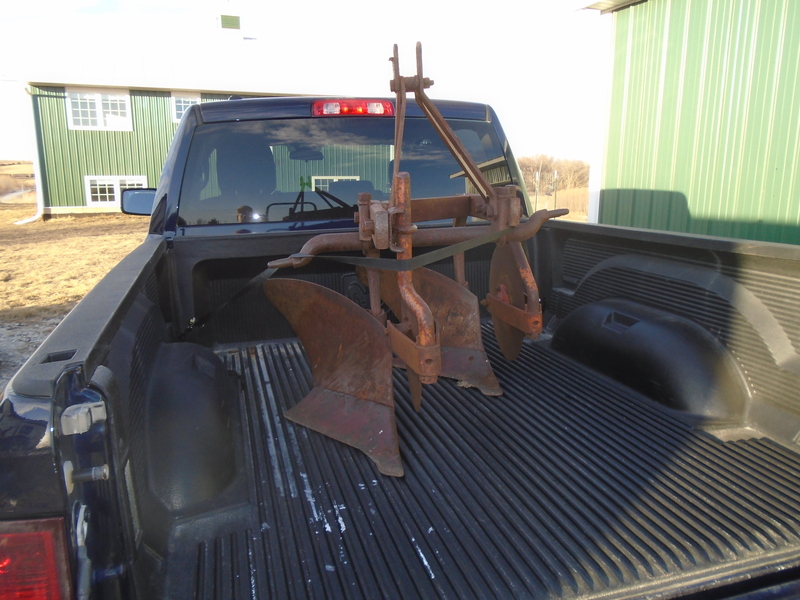 I found this 2 bottom plow on craigslist and thought this is what I needed to get us started. This way I can also put in a food plot for deer hunting. I am starting to collect a few implements, but still need a few more. I have to buy a disk next so after you plow you run the disk over the ground to break up dirt clods. I also would still like to buy a loader for my tractor, so if any of you know of a disk for sale that has a 3 point hitch and is 6 or 8 ft wide please let me know. 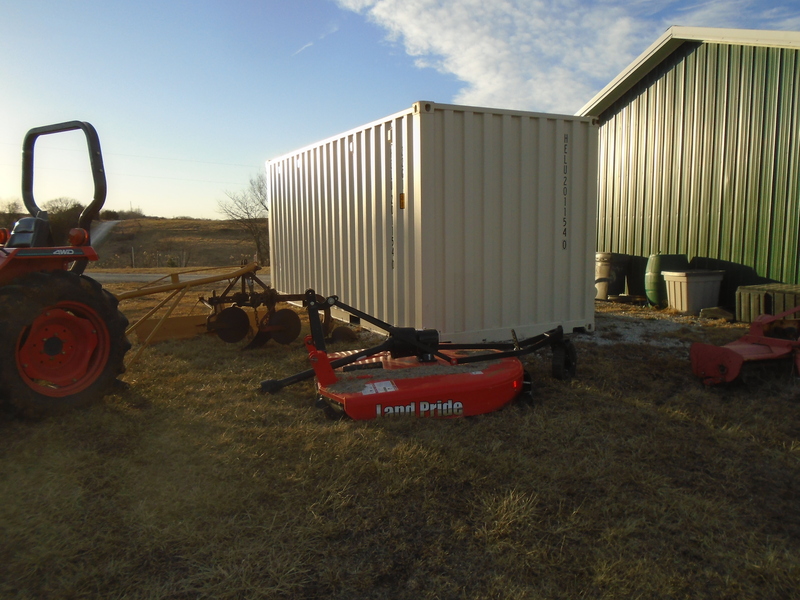 With all these implements laying around its starting to look like a real farm around here. 🙂 Here in the country you see these farms with all kinds of farm implements in the yard, mine are just a little smaller. 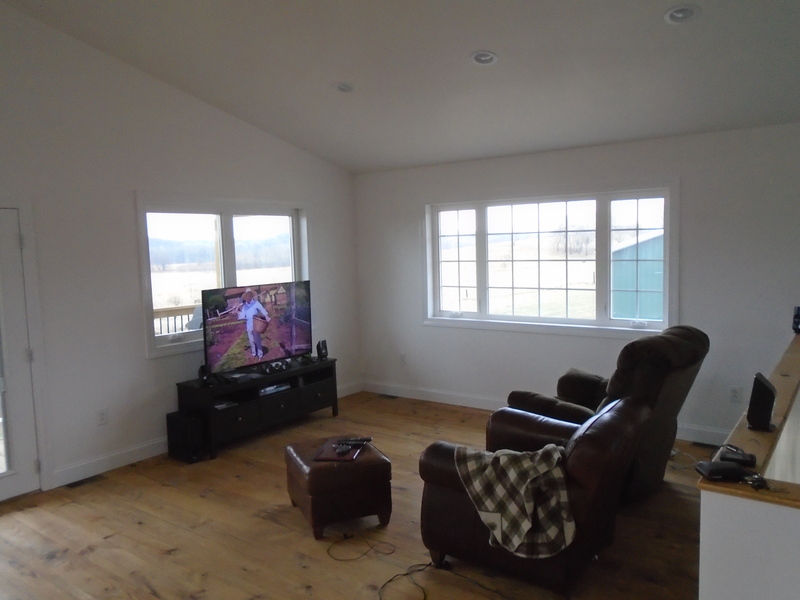 I am happy to report that our upper level living space is done. We do have a few odds and ends to finish up like some small pieces of trim but basically it’s done. Now that we are done with the upper-level we have to finish the basement but we are going to take a long break first. 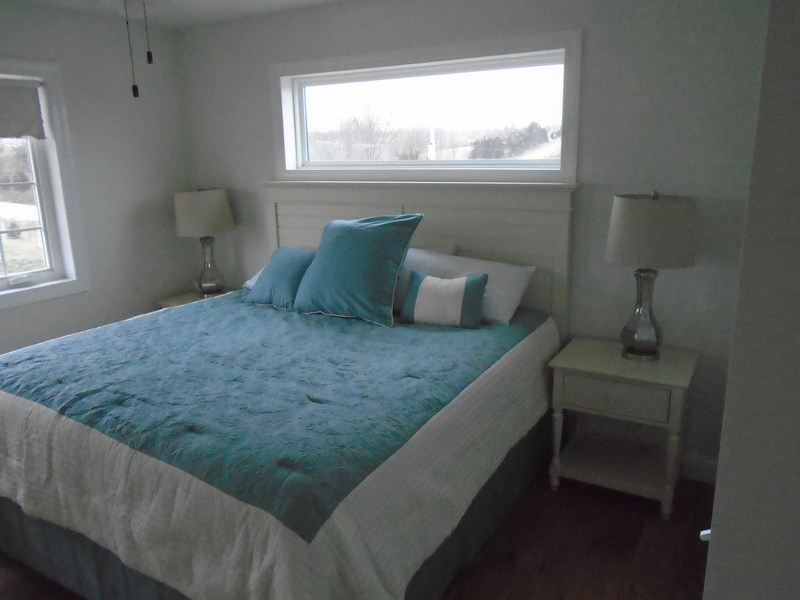 We have been working hard on our home since April 14 and need a break. I do have to finish the stairs in the foyer but I plan to take my time with that. 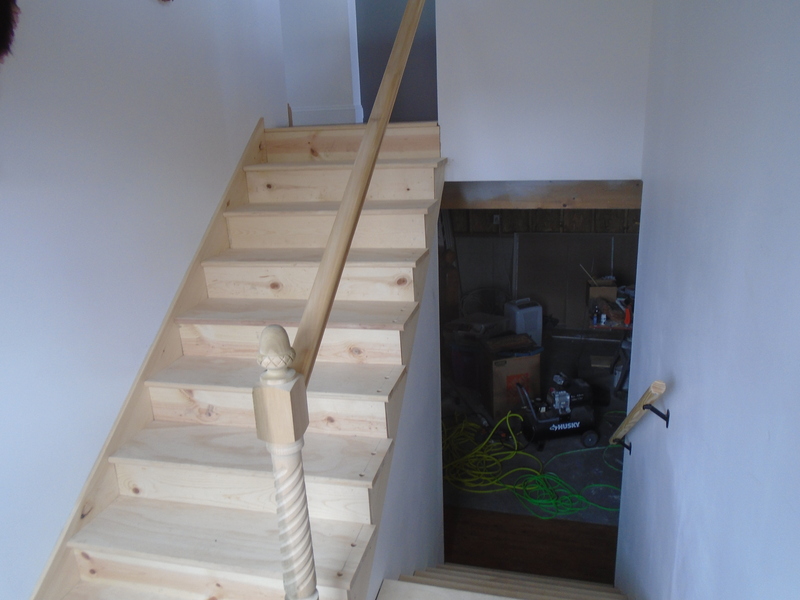 Unfinished stairs in the foyer. Since we posted last, we got some work done. 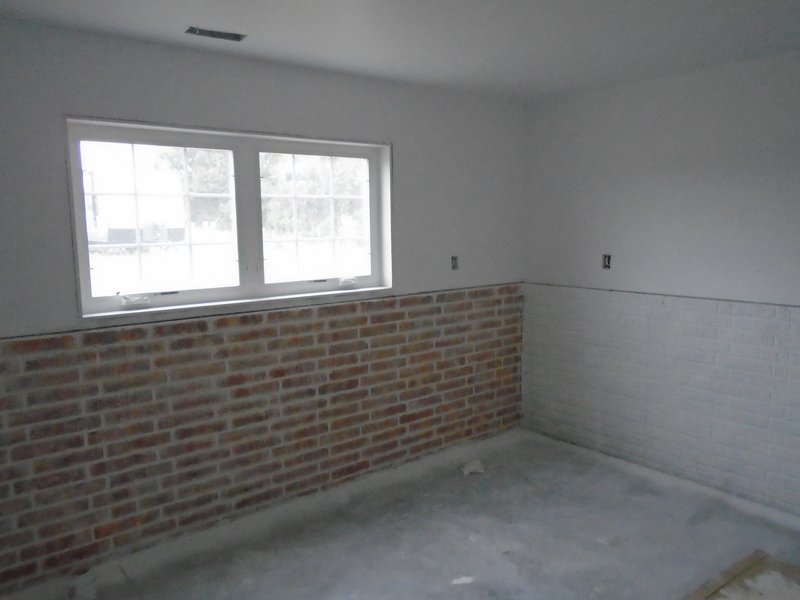 We finished the master bath, the spare bedroom, got our counter tops, cook stove and added some back splash tile in the kitchen and love how it has turned out. Take a look at some more pictures below. 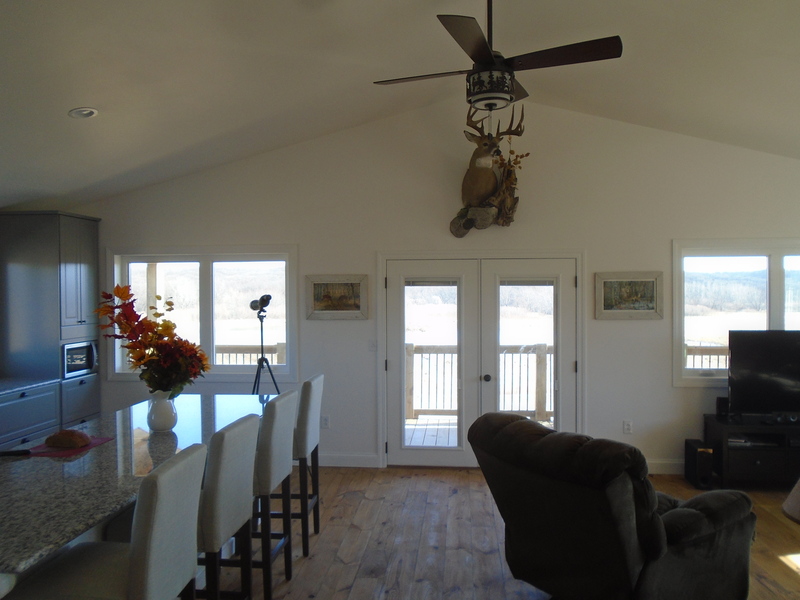 For those of you who have been following this blog for a while know we wanted to create the hunting lodge look and I think we pulled it off. 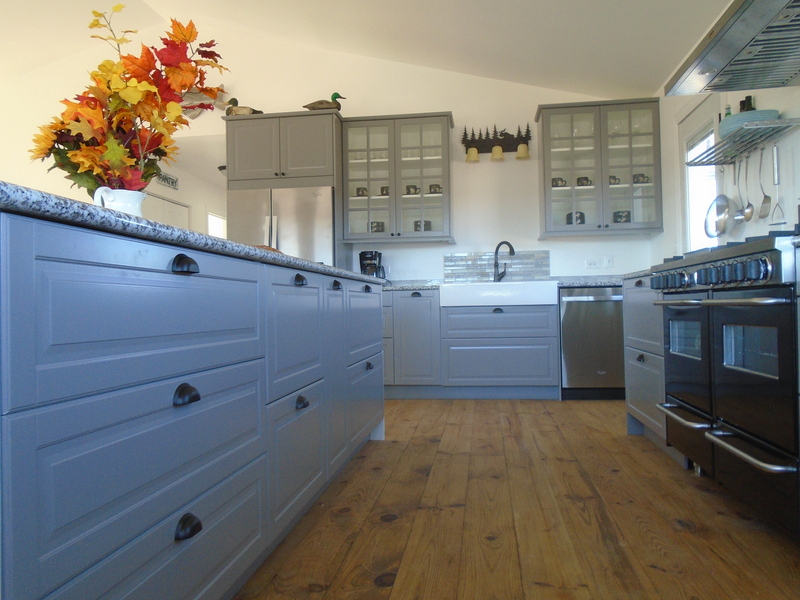 The cabinets are from IKEA and the stove is from A J Madison. We are thinking of calling our home “The Red Cedar Lodge” for the many eastern red cedar trees that grow wild on our property. 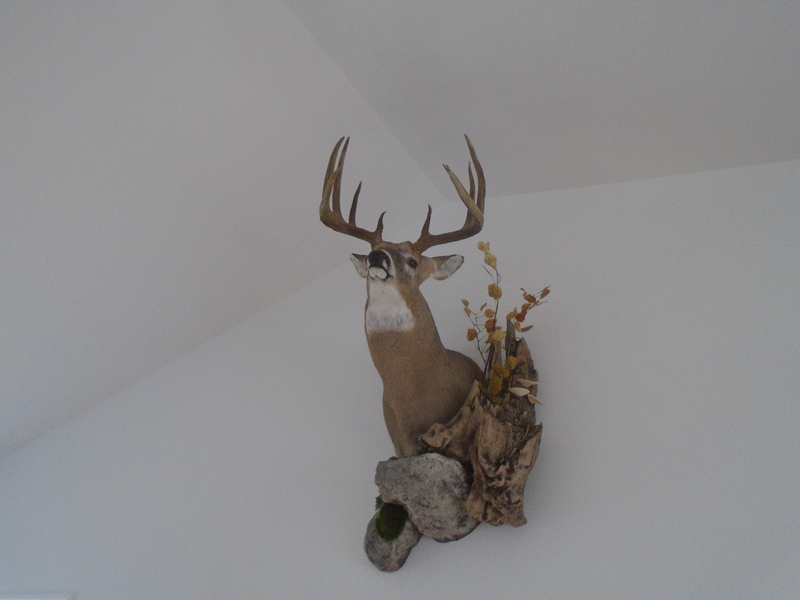 I also got my deer back from the taxidermist and love how that turned out as well. 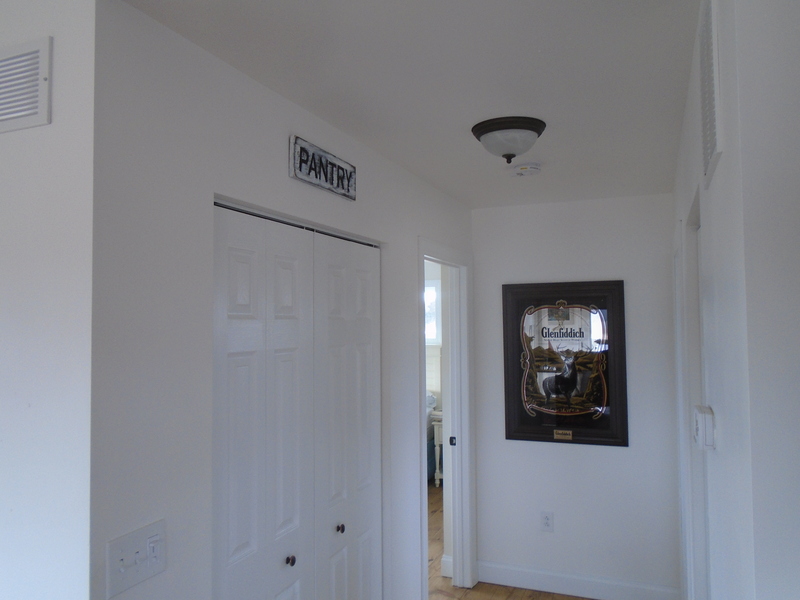 We wanted some thing more than just a animal head on our wall so we selected to have it mounted this way because it was more like a work of art. Counter depth refrigerator, to me regular size fridges just stick out too far and don’t look as good. 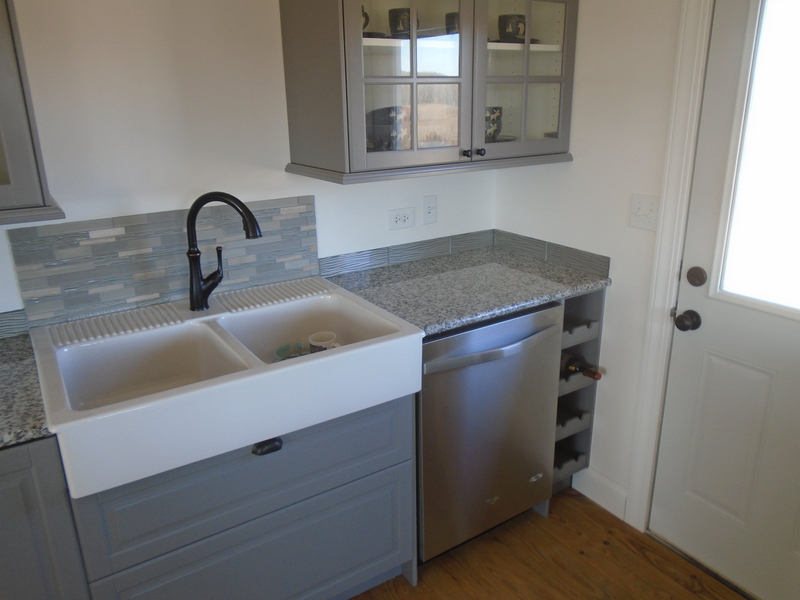 Its all in the details that turn a good kitchen design into a great kitchen design, like this wine rack. 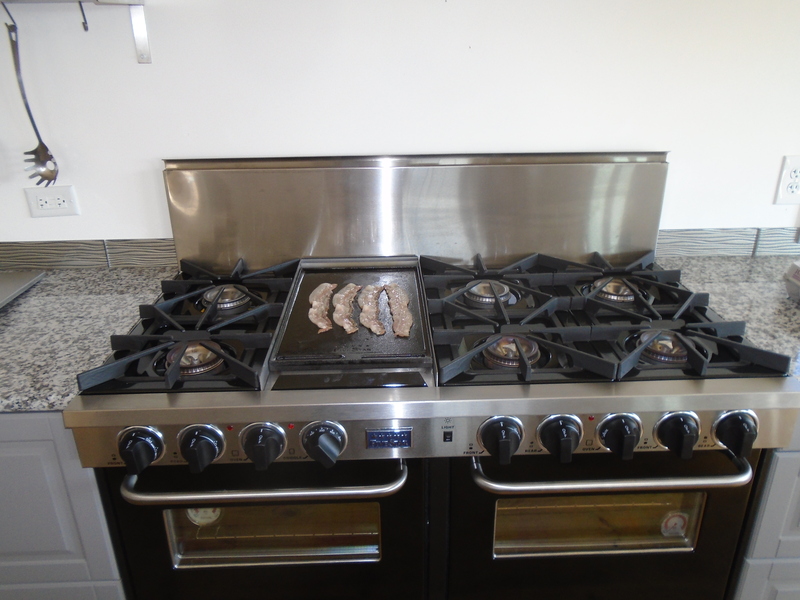 We did splurge on our cook stove but with all the money we saved by doing the majority of the work on our home ourselves we could afford the cost. 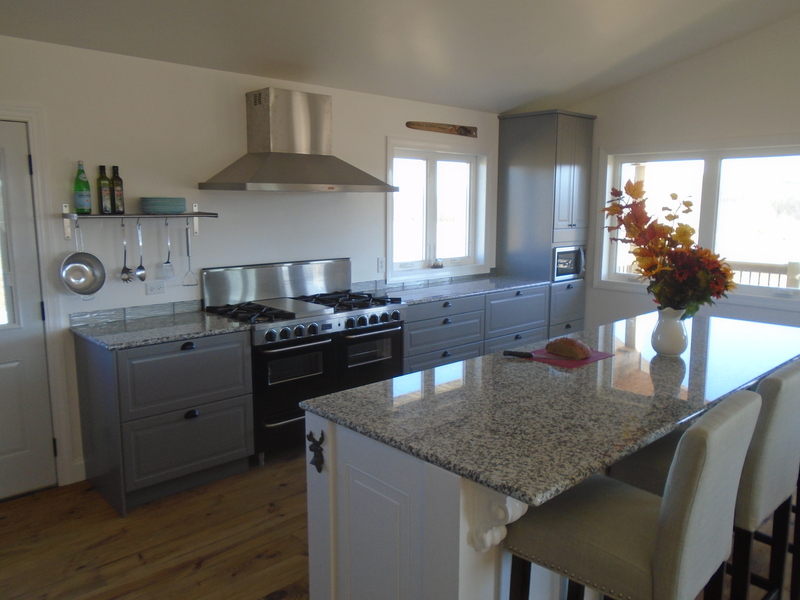 Plus I have always dreamed of a stove like this with the griddle in the middle and this is my retirement home so if I didn’t do it here I didn’t know when I would. My wife turned this old dresser into our master bath vanity, turned out nice. 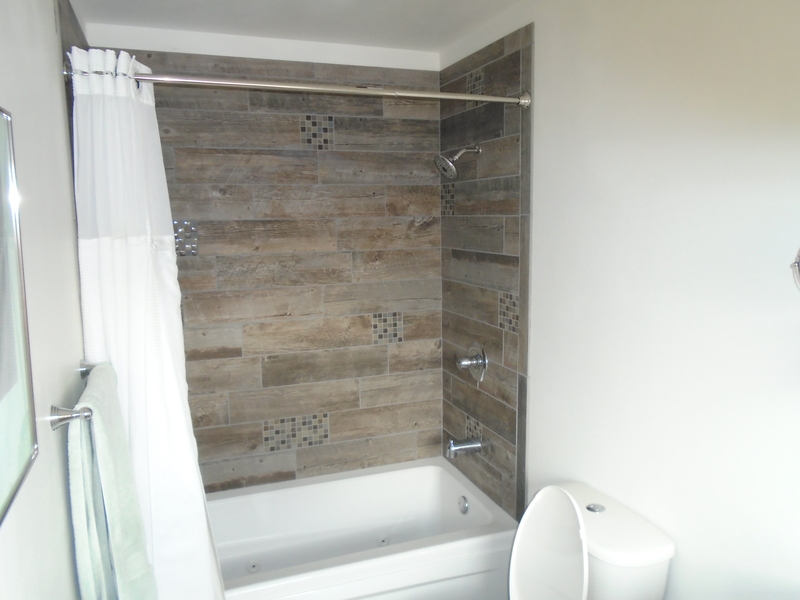 My wife used rustic tile for the shower and tub in the master bath. She got to design our master bath and I got the spare bath. She did a great job. We now plan to sit back and enjoy our home for the time being. What we have left is the rec room in the basement and do some final grading and landscaping on the outside that has to wait until spring. As the wife was grouting the tile in the master bath today I thought I would take time out to walk around the farm just to get out of the house while the weather was still in the 40’s. Come along and I will show you what I found. Our apple trees after I trimmed them. I should say that I wasn’t just taking the day off, I did have some excuse to be out there. I had been neglecting our apples trees and had not done any trimming of them since we planted them in 2011. I also had to cut two of them down that I planted in 2013. I bought those two when they were at a big discount at one of the big box stores. I didn’t know at the time but they were infected with apple scab. They were so heavily infected that they hadn’t grown much in the last 3 years and they were starting to infect the 3 trees I had planted earlier. 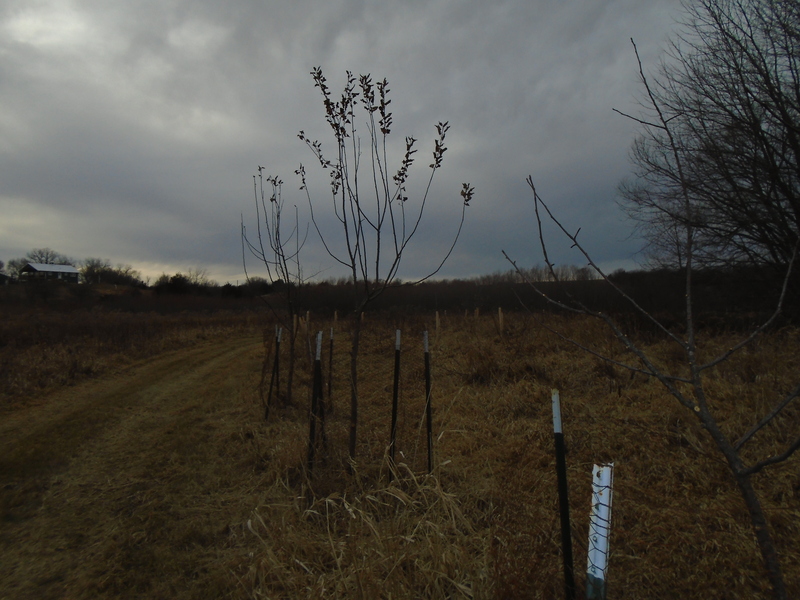 I will have to treat the 3 remaining trees with a fungicidal spray this coming spring and throughout the summer. Beaver den to the left up against the hill and his pantry of sticks on the right. 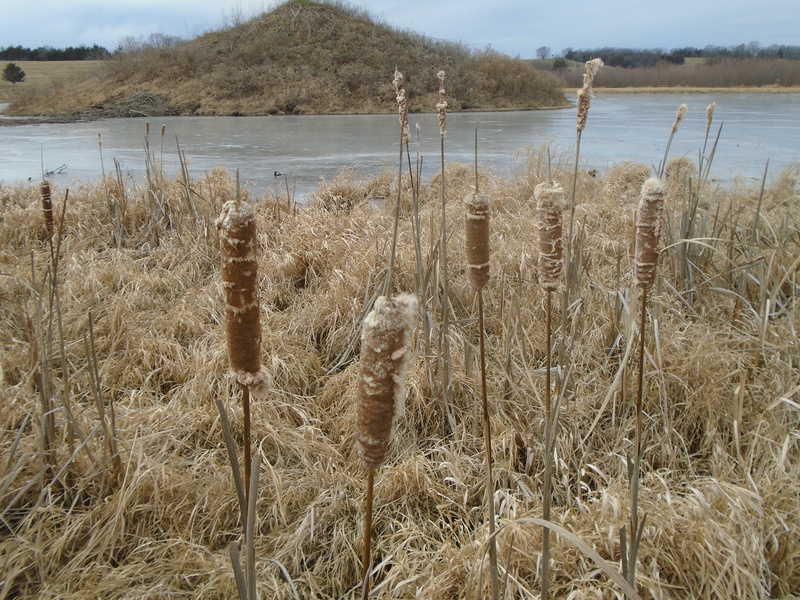 Remember the beavers I reported last winter we had on our pond. Well it didn’t end too well for them. They went across the fence to our neighbors and started cutting trees down onto the fence that separates our land. 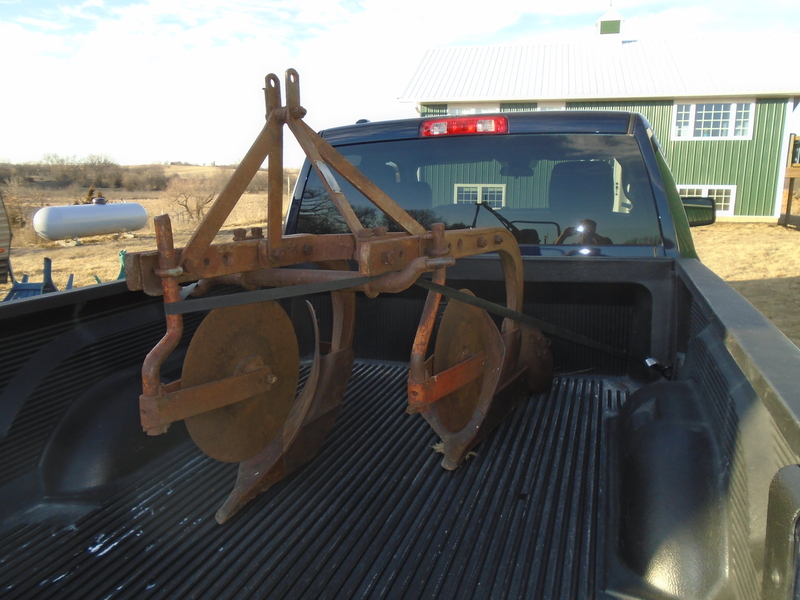 This was allowing the neighbors cows to escape onto our land. It didn’t bother us but the neighbor asked if he could get someone to trap the beaver. With us wanting to be good neighbors we said it was okay even though we felt bad for the beavers and loved to watch them on our pond. 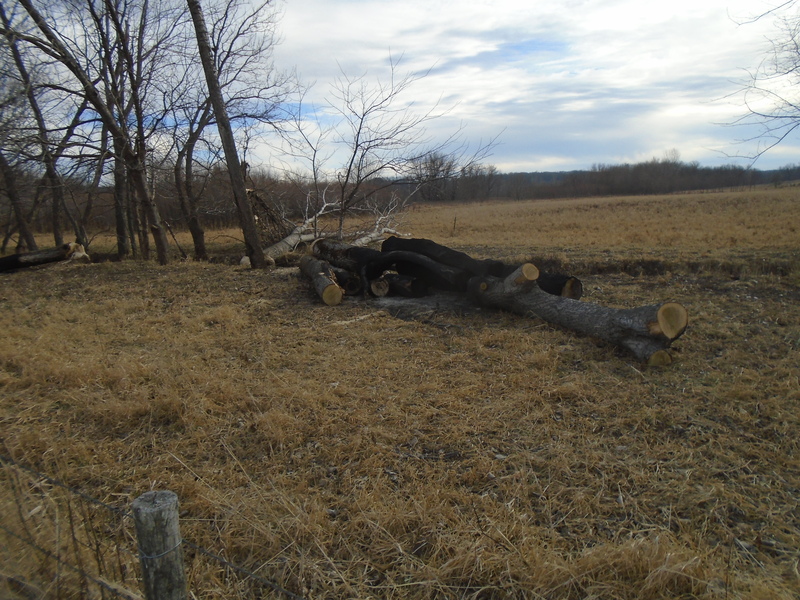 Some pictures below of beaver activity. 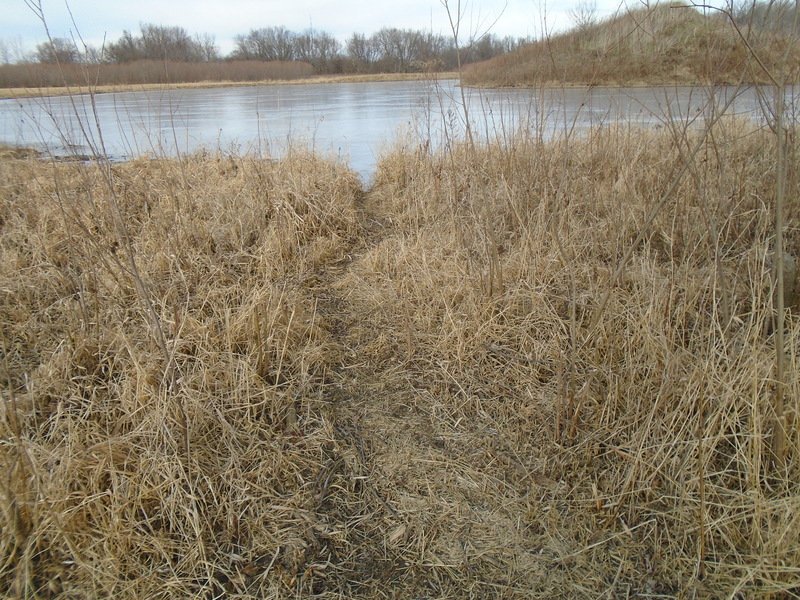 This was one of the trails the beavers were using to go from our pond to the neighbors. 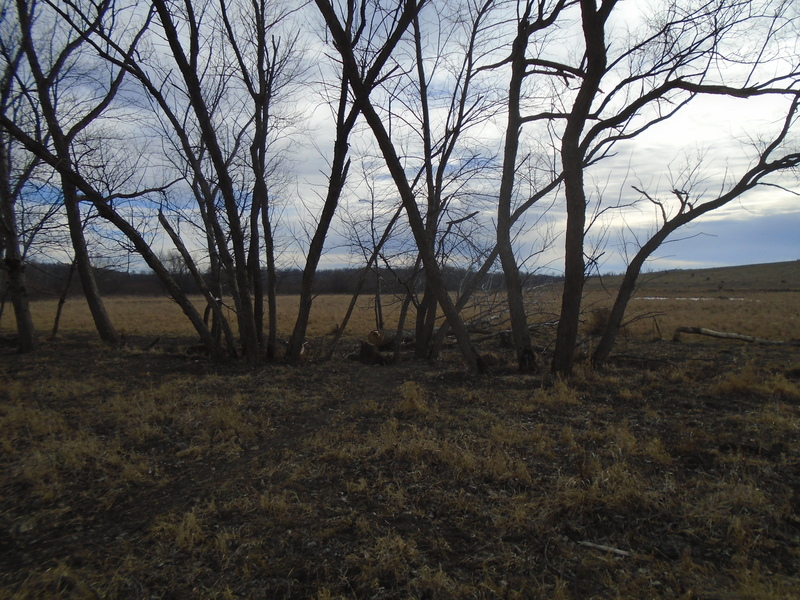 In this picture you can see a few of the trees the beaver cut down. More beaver damage that my neighbor cleaned up and tried to burn. The trapper ended up getting seven beavers on our pond. 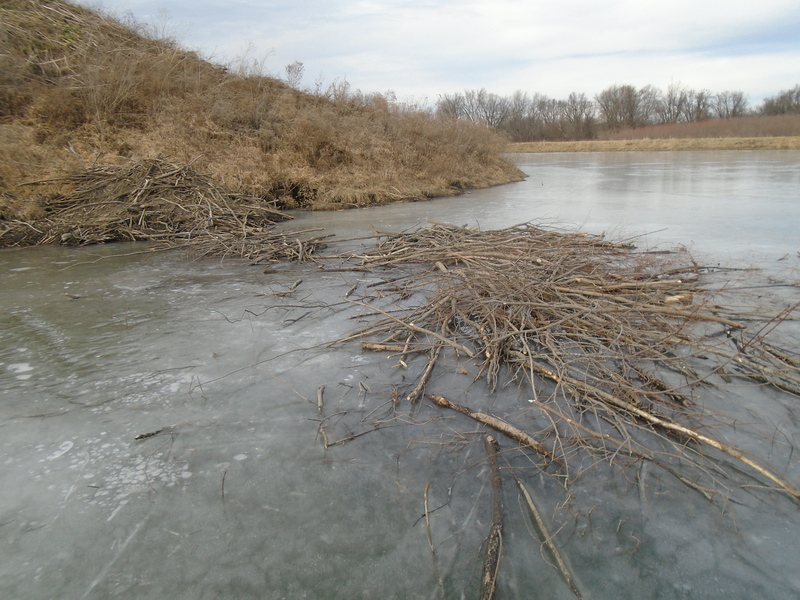 After the last beaver was trapped, it was less than a day before we noticed some river Otters had taken over the beaver dens and were happily eating the fish we stocked this past spring. We were not too happy about these new developments but what are you going to do? They were sure cute and we liked watching them too. 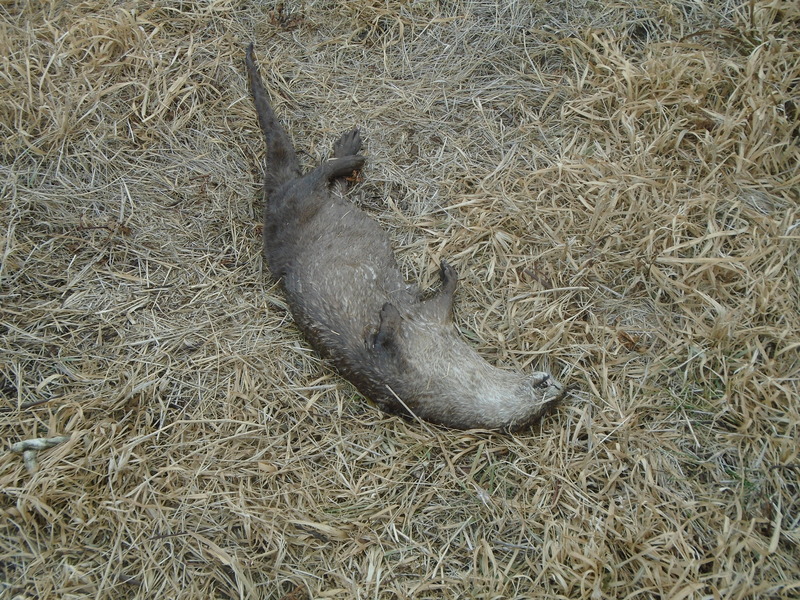 I found a dead Otter along our pond. 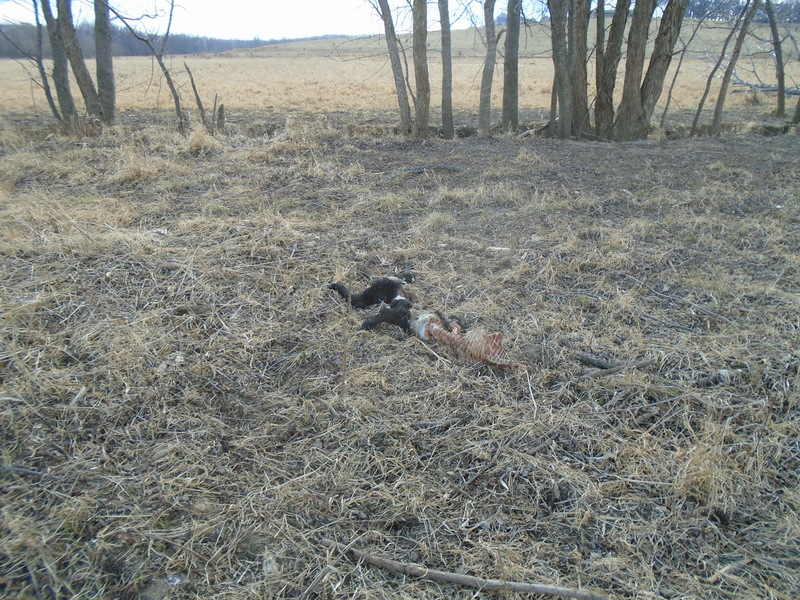 While walking around I did find a dead otter by our pond. I don’t know how it died but did find it interesting. It was a family of 5 otters that we saw on the farm so hopefully the rest are still there. While I was down there I spotted some tracks of a big Bob Cat. 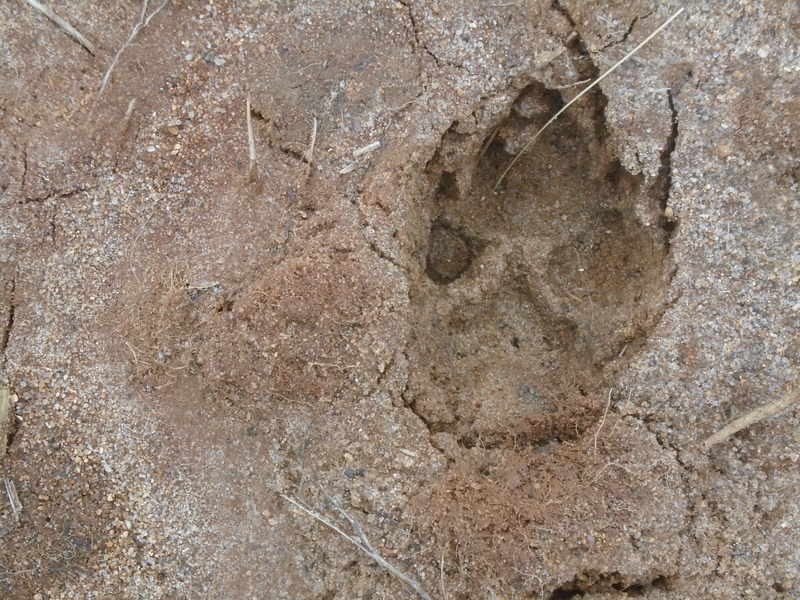 The tracks lead to the remains of a calf. He had stripped the hide down and all that remained was hide and bones. The dead calf he was eating on was very small and couldn’t be that old. I don’t know if he had killed the calf or if it died during child birth or what. 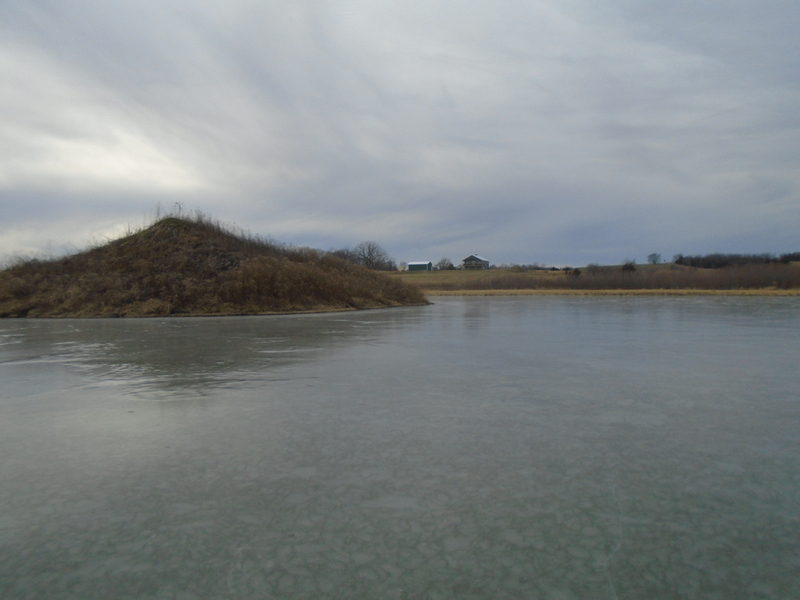 The Ice on our pond was just over 3 inches thick and made it easy to walk on. I always love going for walks to view this beautiful land and I always feel so blessed to be the caretaker of it the short time we will be the owners. I look back at our home and think last year at this time it wasn’t there. We have sure come a long way. 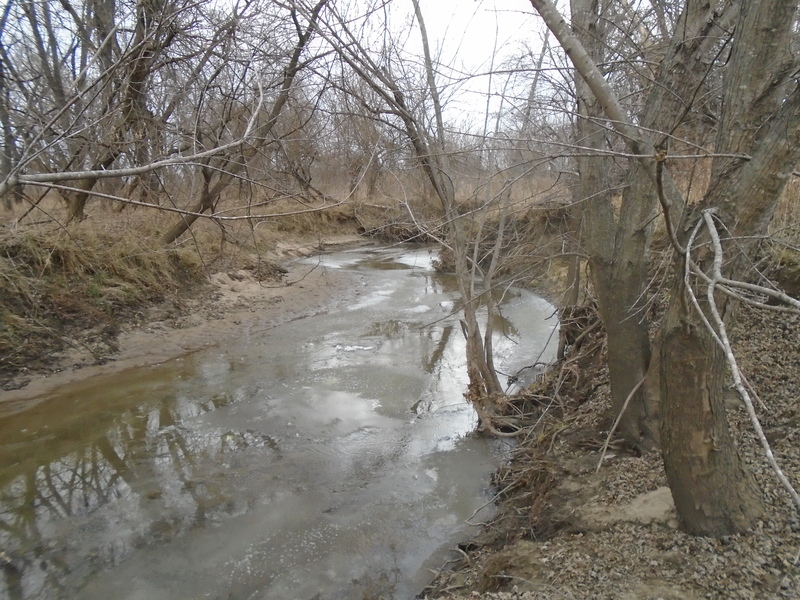 The creek that runs along our north border. Well I hope you enjoyed walking along with me on our farm. 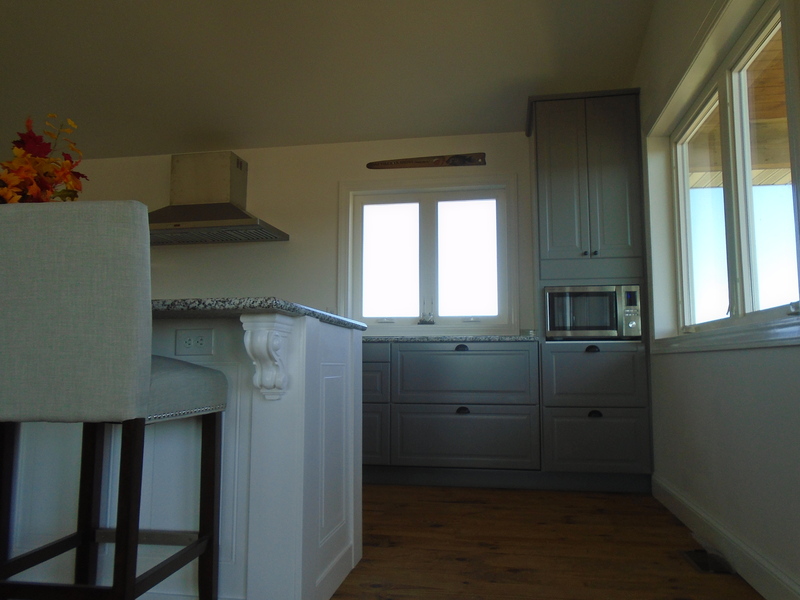 We are still waiting for our counter tops and cook stove to be delivered and will show them once they are installed. We hope everyone enjoyed the Holidays and till next time, goodbye. 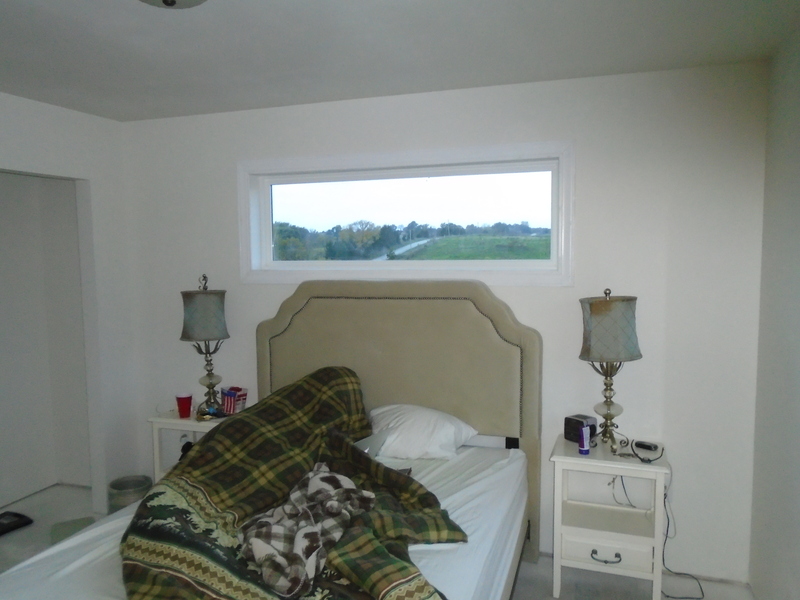 We got our master bedroom done. 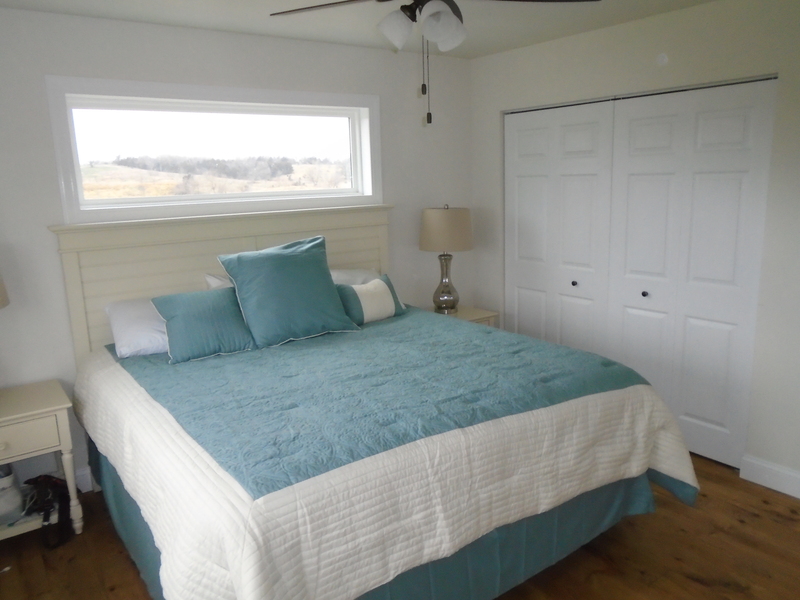 I want to get you up to date on our home building progress and I am happy to say we have our master bedroom done. We splurged on a very good king pillow top mattress because after sleeping in our camper on a very thin queen size camper mattress for 7 months it now seems like we are at a resort and we are loving it. 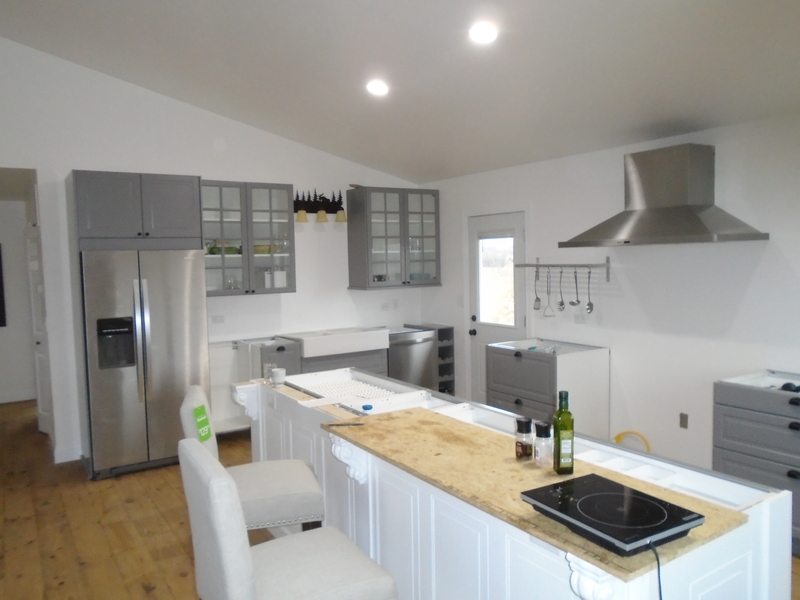 I am also happy to report we have our refrigerator and kitchen cabinets in and are waiting for our granite counter tops and our cook stove. We are now cooking in our home instead of having to go out to our camper. The camper is now winterized and we will put it up for sale come spring. We have done enough camping for a life time and at this time don’t plan on camping again anytime soon. 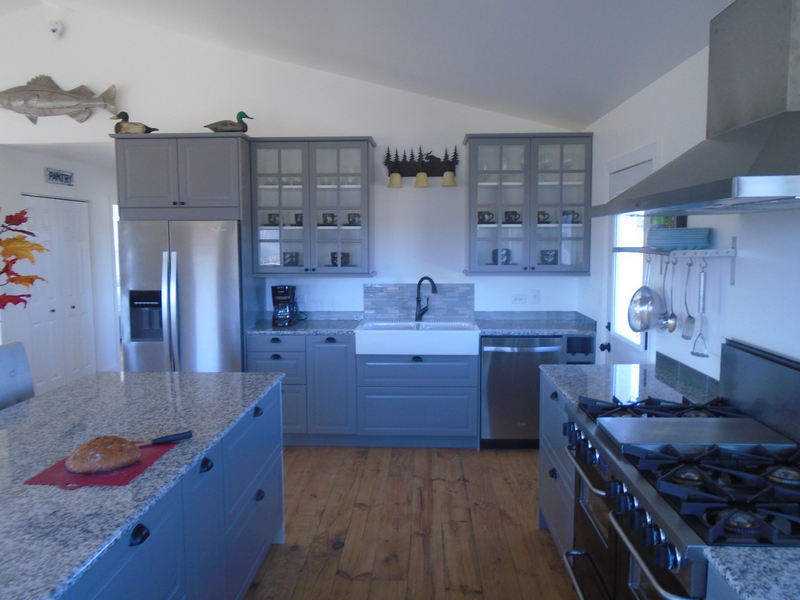 The Island took some time to do but we love the way it has turned out. 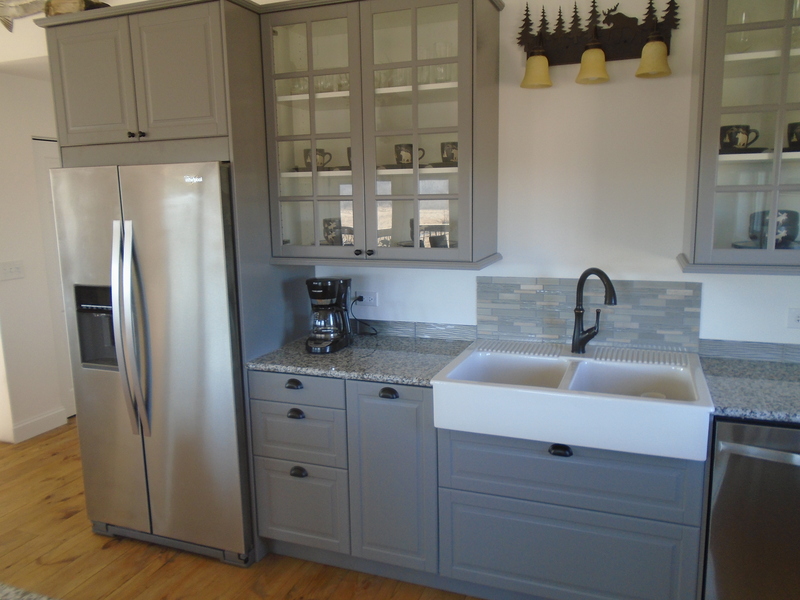 It is basically just a two by four wall with paneling and some pvc trim surrounding 4 cabinets as you can see by the picture below. 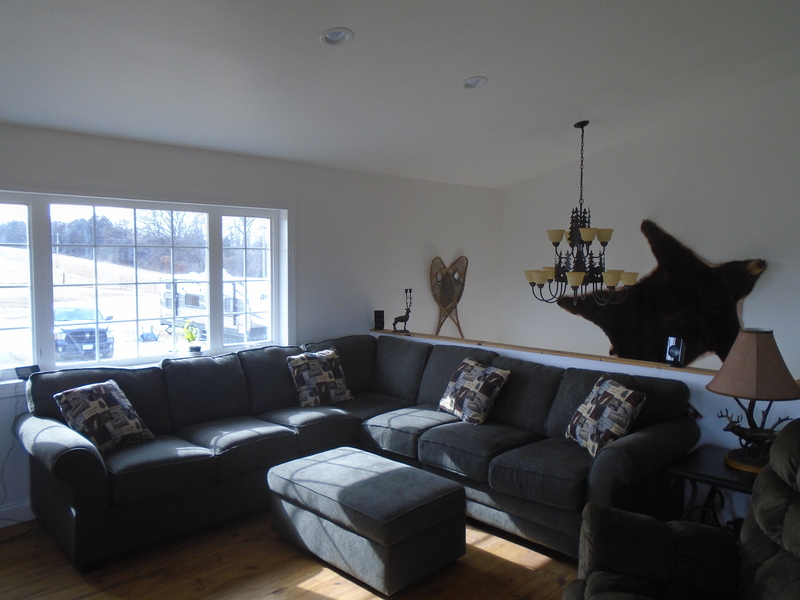 We have ordered a new sofa sectional and should be here in about 3 weeks. 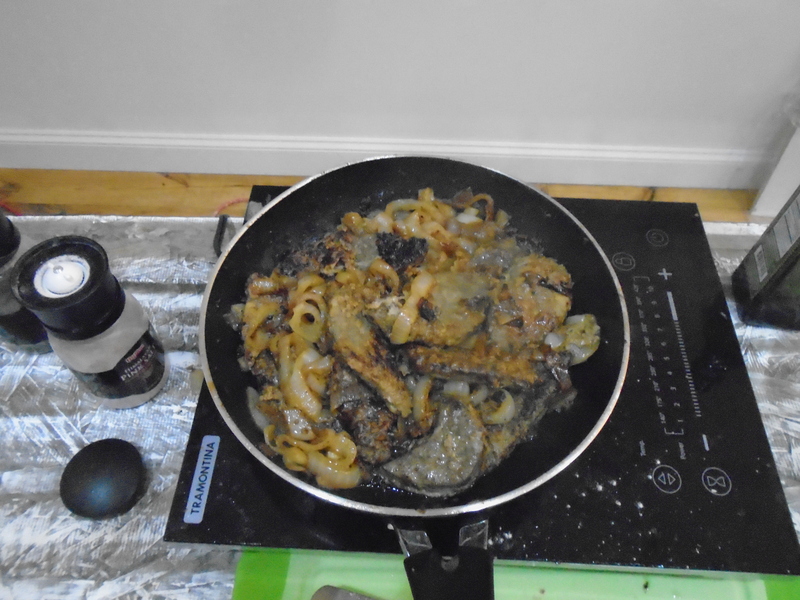 We have been enjoying our venison and made some venison liver and onions on our temporary cooking stove. 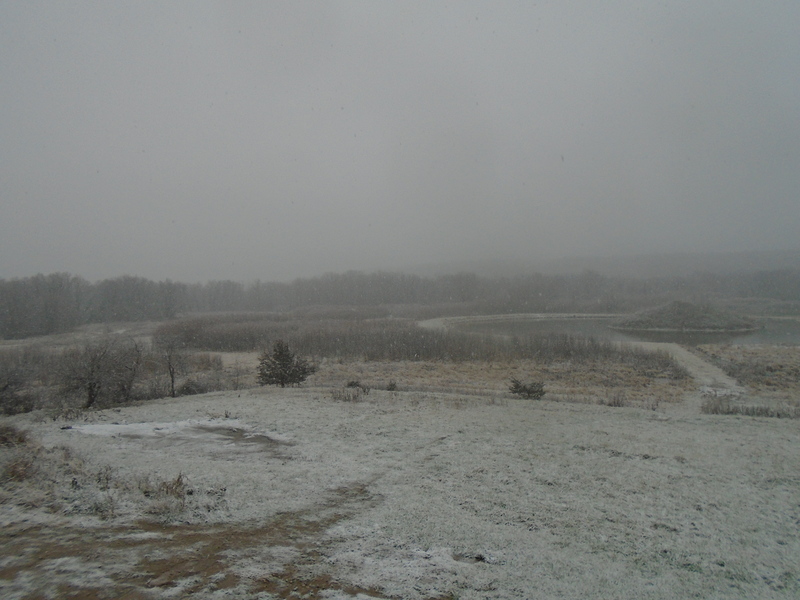 This is our first winter here and I think of how blessed we are to see these views everyday. Well that should do it for now. 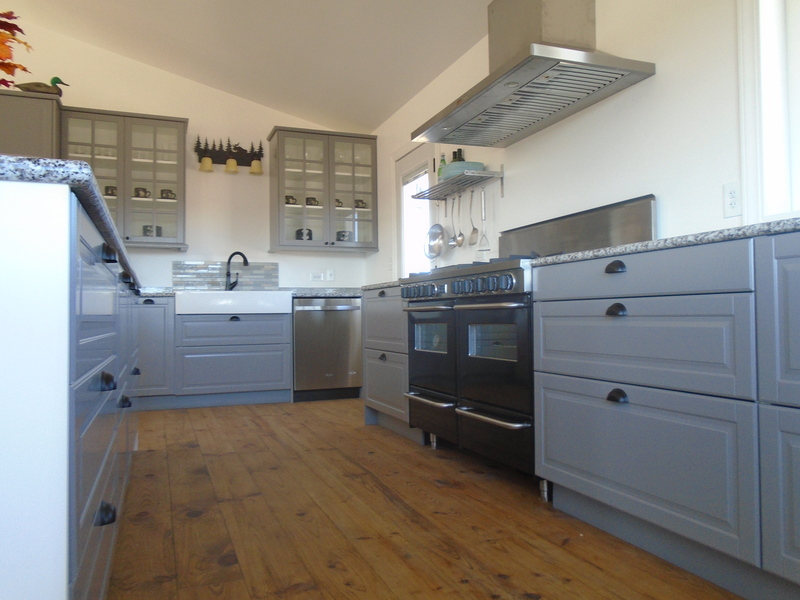 Next time we should have lots to show you of the finished kitchen and living room, I know we can’t wait for it all to be done. Hope everyone has a Merry Christmas and Happy New Year. 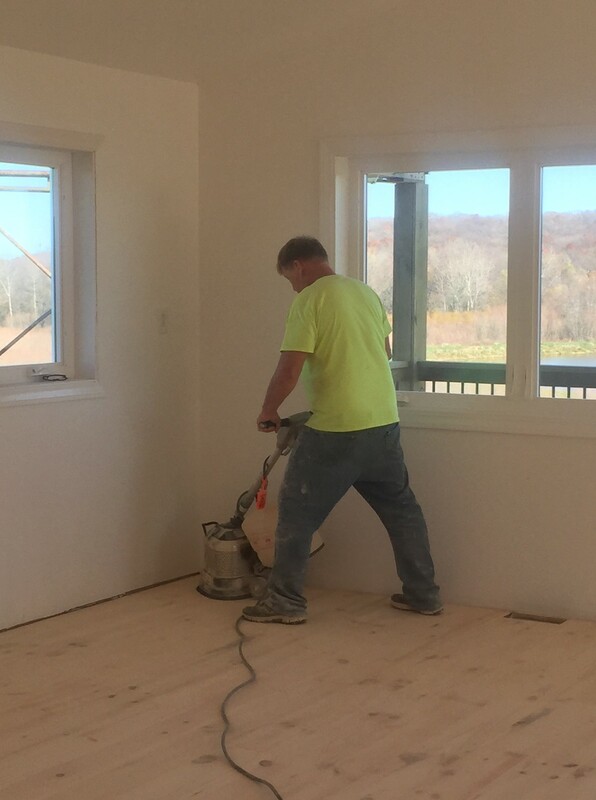 This is me using an orbital sander on our wide plank pine flooring. Like she has this whole build, my wife has really been a big help. 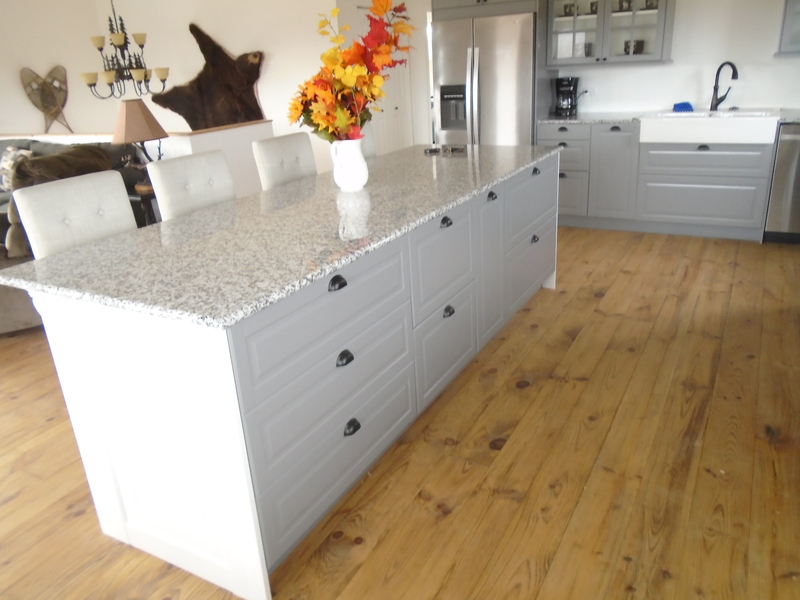 We just finished installing and finishing our hardwood flooring. It wasn’t that hard but did take a lot of time and labor. I can’t believe we are this far along and can really now see the light at the end of the tunnel. 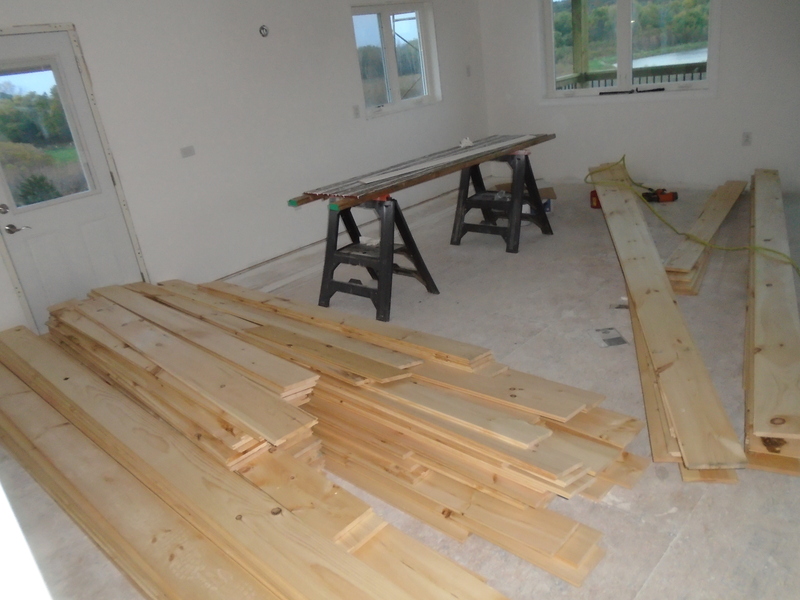 After we received our flooring we let it acclimate for about two weeks before we started laying the floor. We wanted to make our flooring as tight as possible so we used a bar, scrap piece of flooring and a 2×6 that we screwed into the sub-floor. This way its hard to see where the seems are. 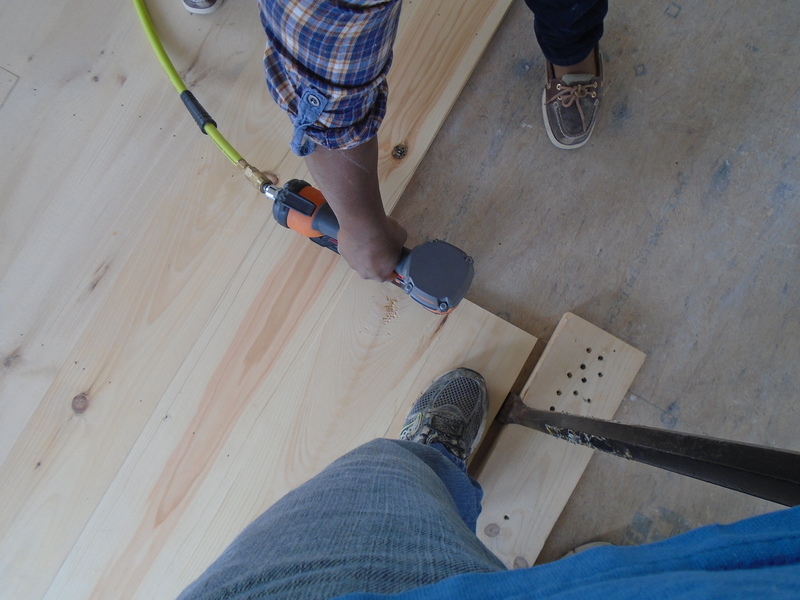 We decided to face nail the flooring using our trim nailer and we put 3 2 1/2 in galvanized nails every 16 inches where every floor joist was. 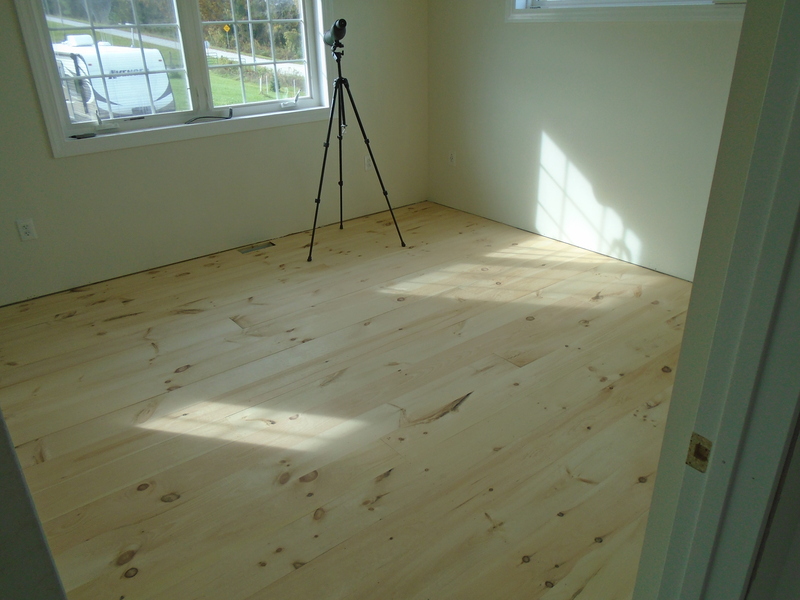 The finished flooring really looks good. 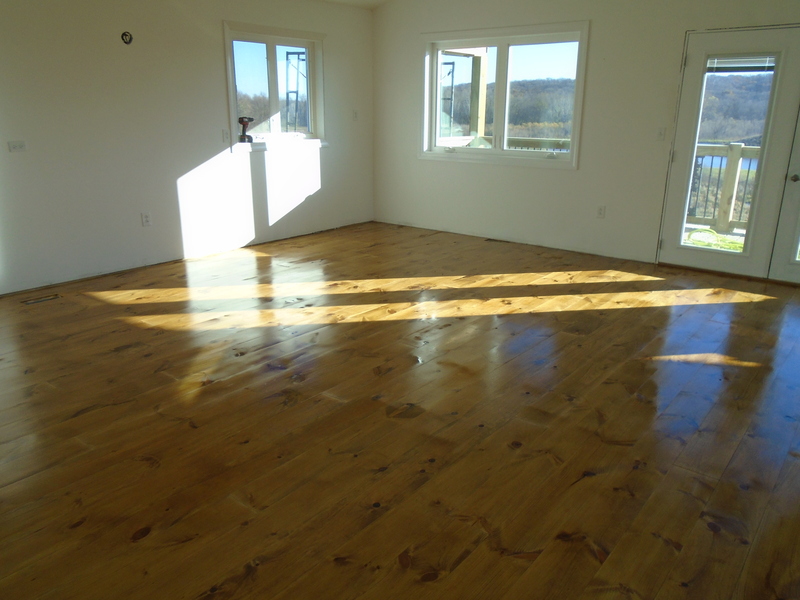 We used a dark tung oil to finish the flooring the way they used to do years ago before chemicals. 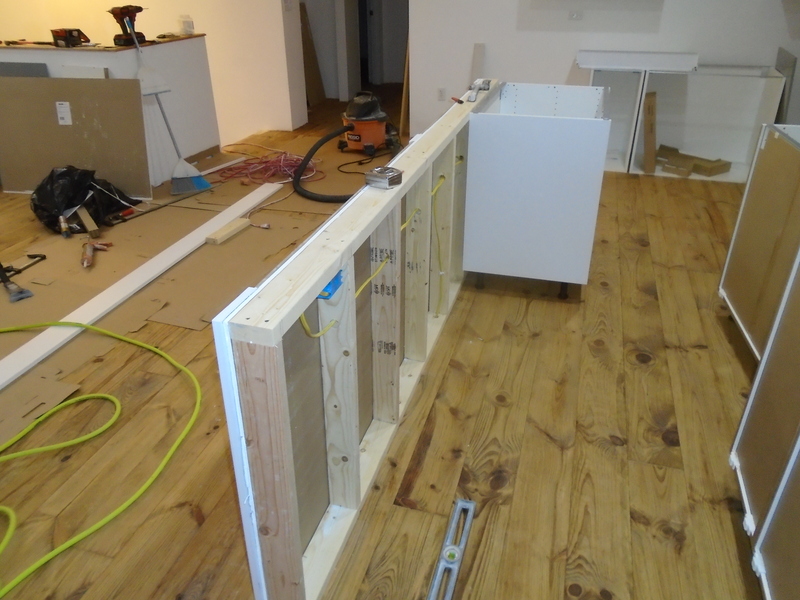 Now just a little bit of baseboard and we are ready for kitchen cabinets. My first deer on our farm. I took some time off from working on our home to hunt deer this fall and in just my third time in my tree stand I was able to shoot a big ten point buck. I used my 50 caliber Kentucky rifle and it was during the early muzzle loader season here in Iowa. This deer was well over 200 pounds even after I field dressed him. He was so heavy I could not drag him out of the woods myself. I had to go get my wife who was not too happy to help. Iowa has some of the best whitetail deer hunting in the world with lots of record bucks taken here. I have hunted lots of deer in different states but have never seen bucks this big. I have also not seen better deer hunting than what I have here on our farm and I have seen more deer than I have ever seen in just sitting in my stand 3 times. 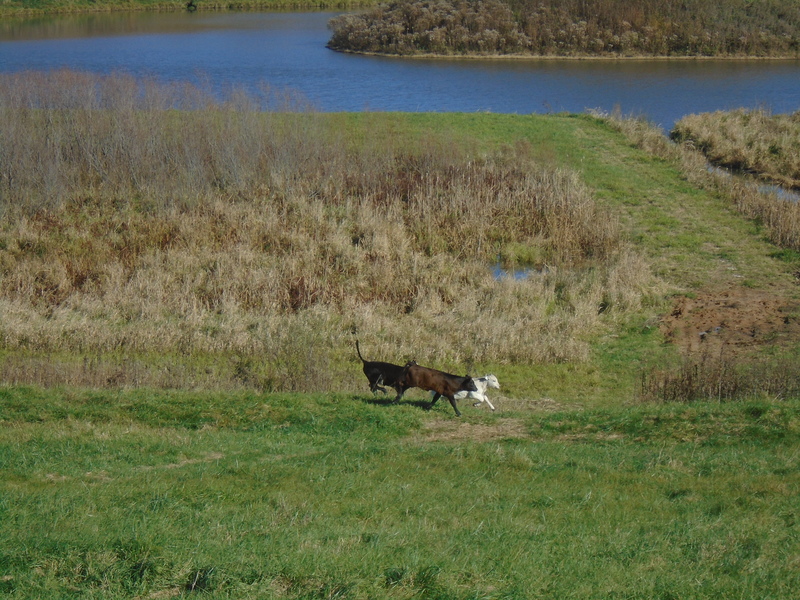 Our farm isn’t the best for farming but it has world class deer hunting. 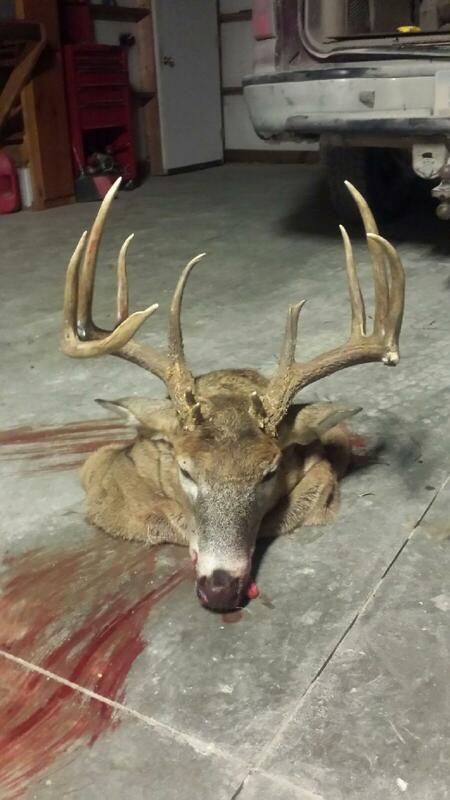 This deer will score close to 170 and those of you who follow this blog saw a 184 scored buck taken off this farm last year. 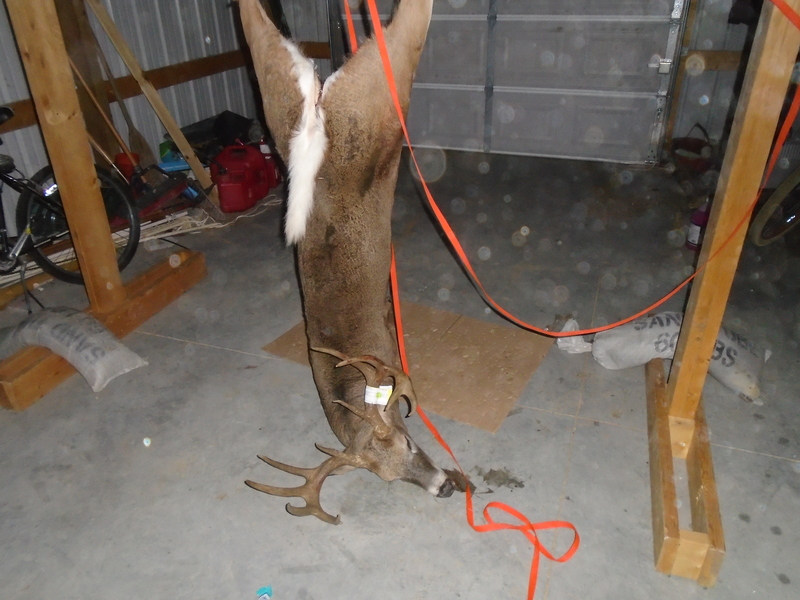 This buck was harvested off our land last year from a friend that I let bow hunt. The deer scored 184 points. The deer hunting is so good in Iowa that a lot of people who live out of state try to say that they are residents here so they can hunt. 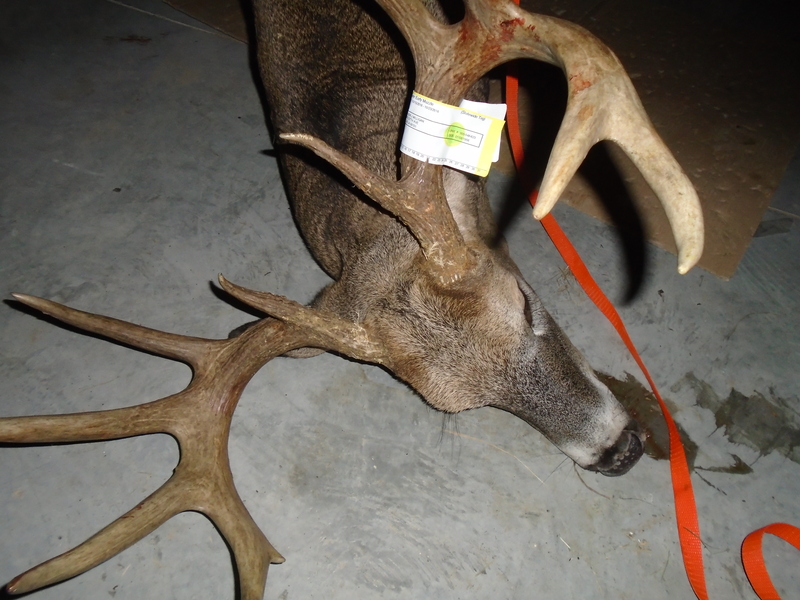 If you are not a resident it is very expensive to hunt deer and there is a lottery drawing to get an out of state tag. Before I could buy a hunting license here I had to prove I lived here for the last three months and had to provide a copy of my drivers license, utility bills, property tax bill, a recent pay stub that shows I have been paying state income taxes for the last 90 days. You also have to have a copy of your vehicle registration, and a copy of your lease or property agreement. I provided all of that but the state still had a DNR officer come out to our farm to make sure we were building a home and not just living in our camper. I asked the officer that showed up here why they go through such a tough process to get a resident license and he told me they have lots of people who buy land here just to claim they are full time residents. 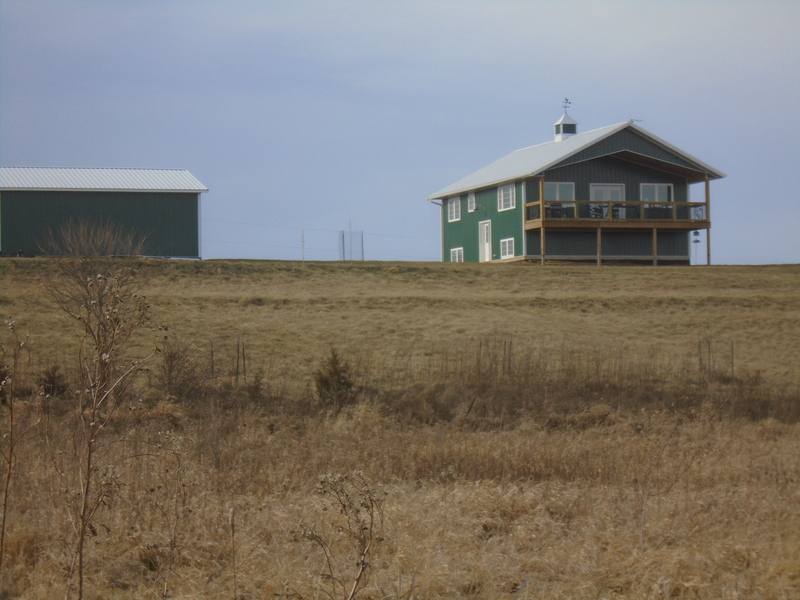 It has been a long time dream of mine to move from Chicago to start our farm here in Iowa and I am so glad to now be living that dream. 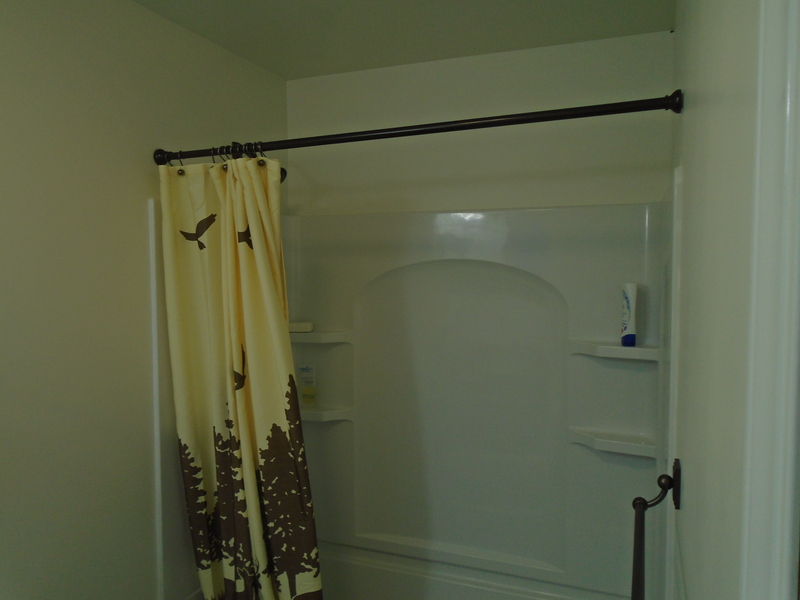 This is one of the bathrooms we have done so we could move in. We have moved into our house even though it is not nearly done. 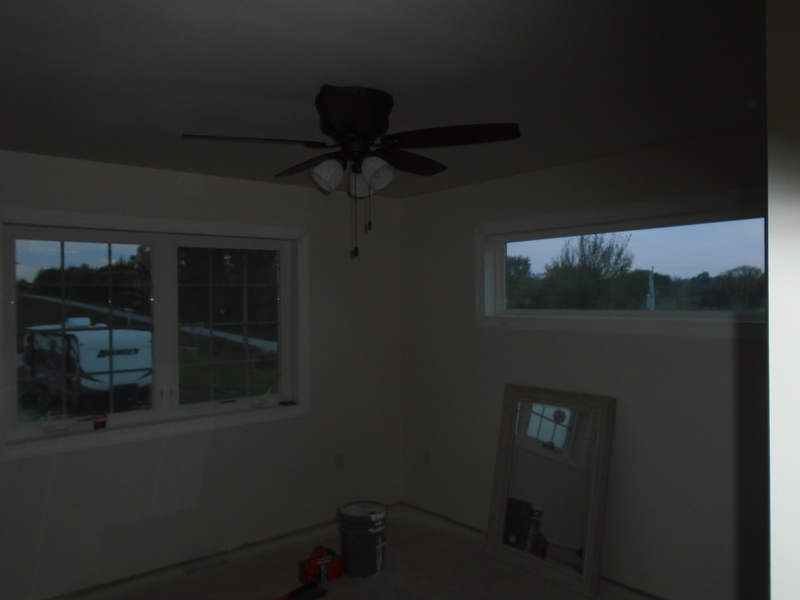 With the temperatures getting down in the lower 30’s F a few nights ago that was all the reason for us to go ahead and get in the house, even though there still tons of drywall dust we are enjoying being in the house. Its so nice having a regular sized shower instead of the very small one in the camper. We have gotten a lot done since my last post. 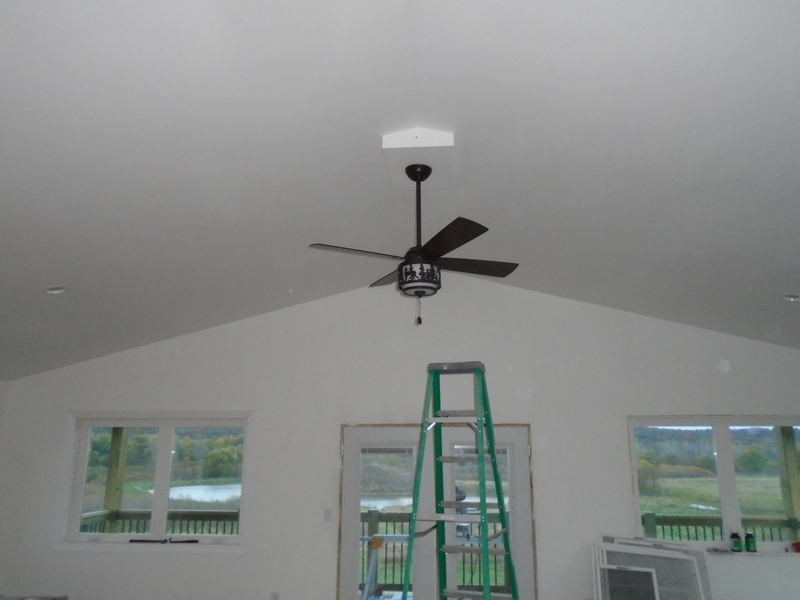 We hired a company to do the drywall, than my wife and I painted the whole interior of the house in 3 days with a paint sprayer we borrowed from my brother Danny. 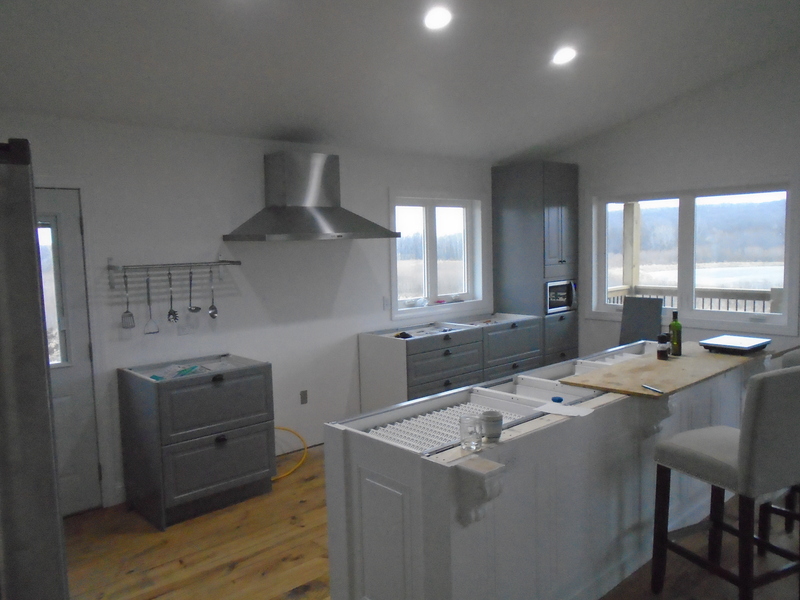 The light fixtures, receptacles, and switches are all in and now we are working on the trim. 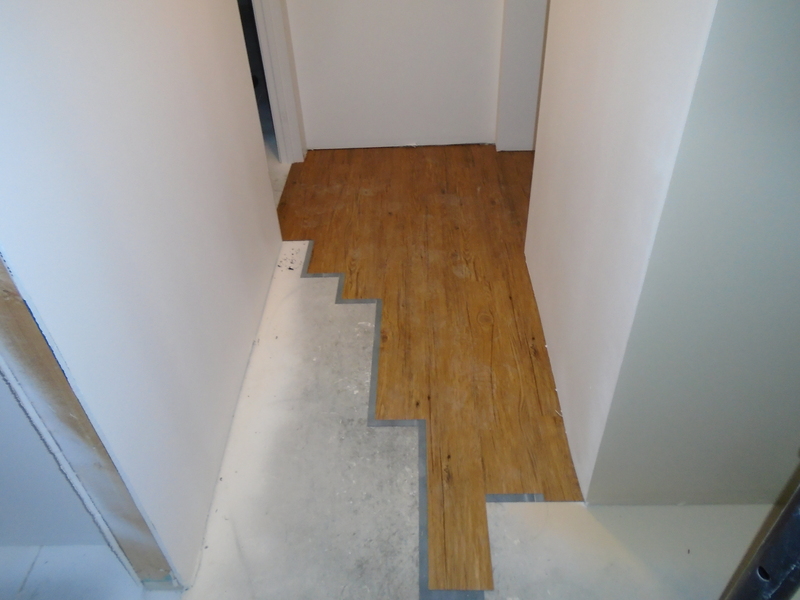 We also have been putting down some vinyl flooring in the basement and this stuff really looks great. My sister Becky suggested it and I didn’t think I would like it because I remember when it first came out, but t has come along way since then. The vinyl flooring we have started putting in the basement. We have come along way from when we broke ground on April and I didn’t know if it would be livable by winter but we have made it. 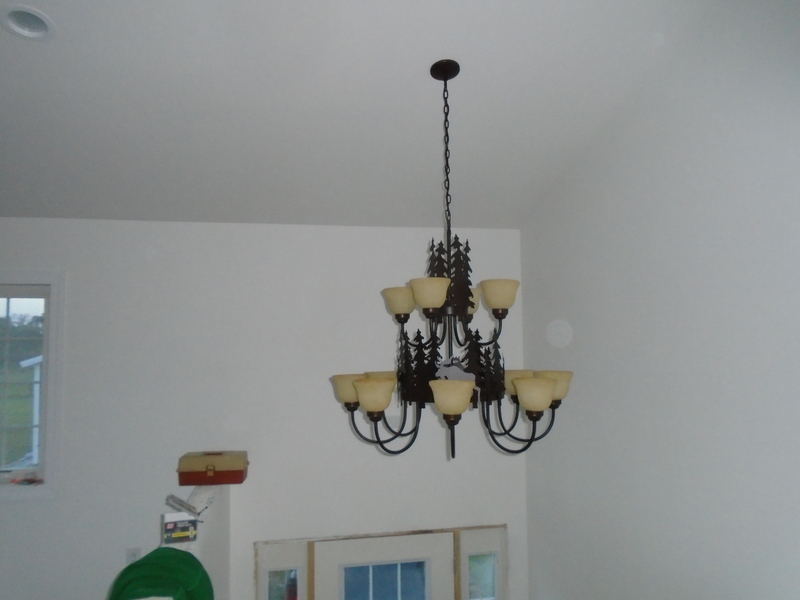 I have been waiting two years to get this cool chandelier up. 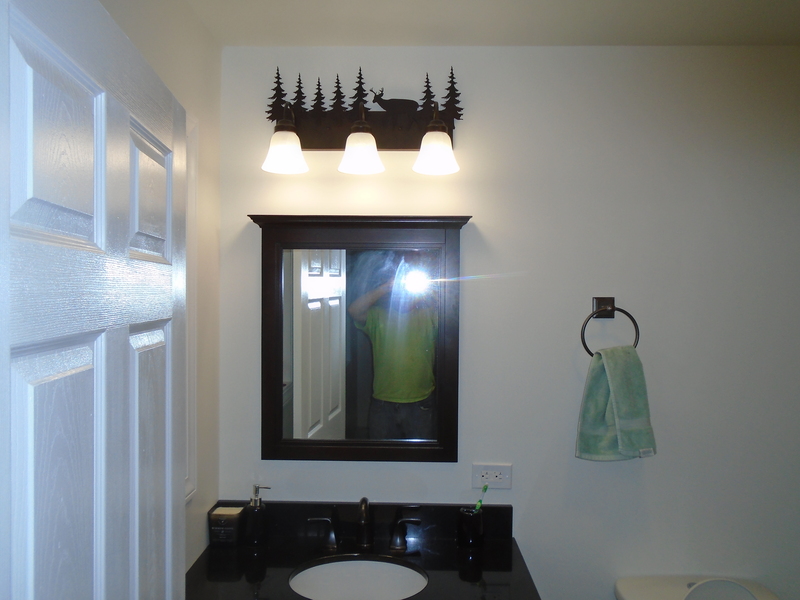 Some of our light fixtures where bought when we still planned to build a log home. This bed is set up temporarily until we get some carpet in the basement bedroom that is coming on the 24th of this month. My wife was annoyed at me for taking this picture with her still in it. 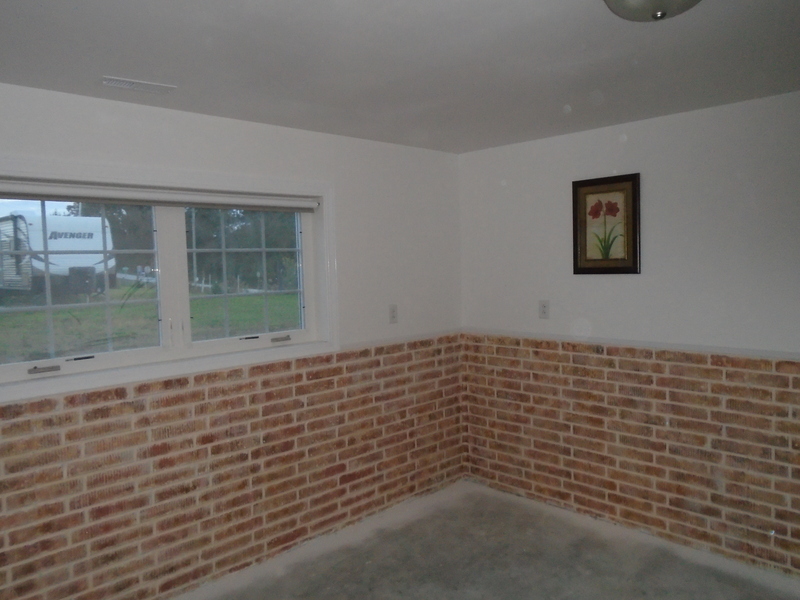 This is the basement bedroom will will move into once the carpet arrives. My wife wanted to paint the basement walls so they don’t look so plain and I love how it has turned out. This is 1100 sf of 8 inch pine tongue and groove flooring and once it acclimates for at least a week will will start to lay that. As you can see its a work in progress and that is about it for now, thanks for looking. keep posted for new updates and below are a few more pictures. 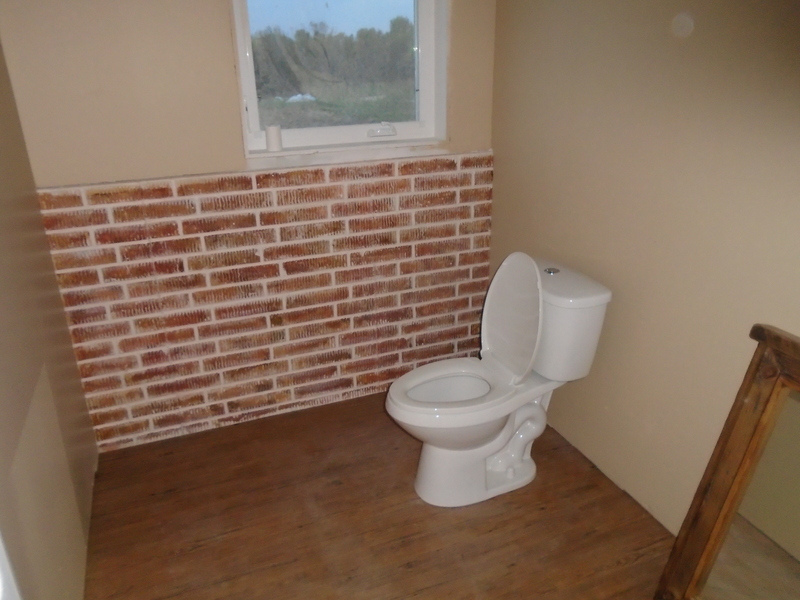 The start of the downstairs bathroom. We still haven’t found a vanity that we think will go in there. 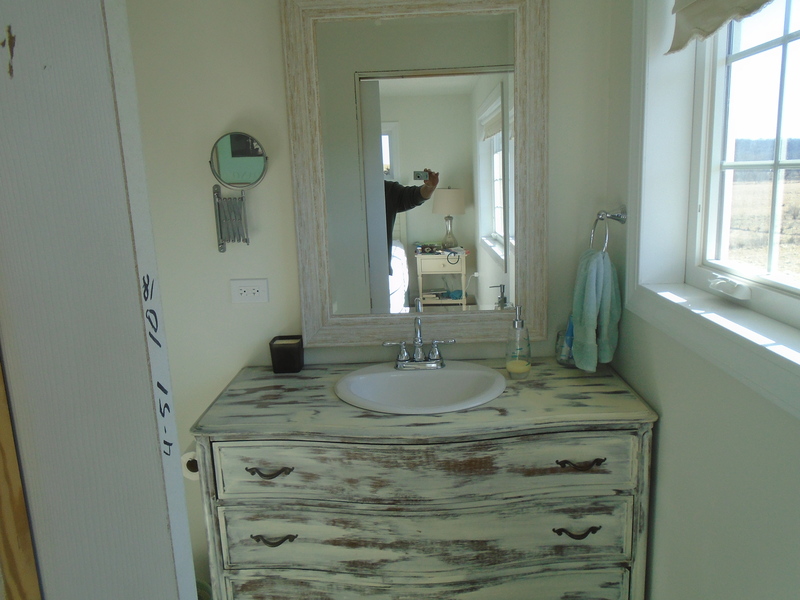 We are looking for an antique dresser that will make into a vanity. 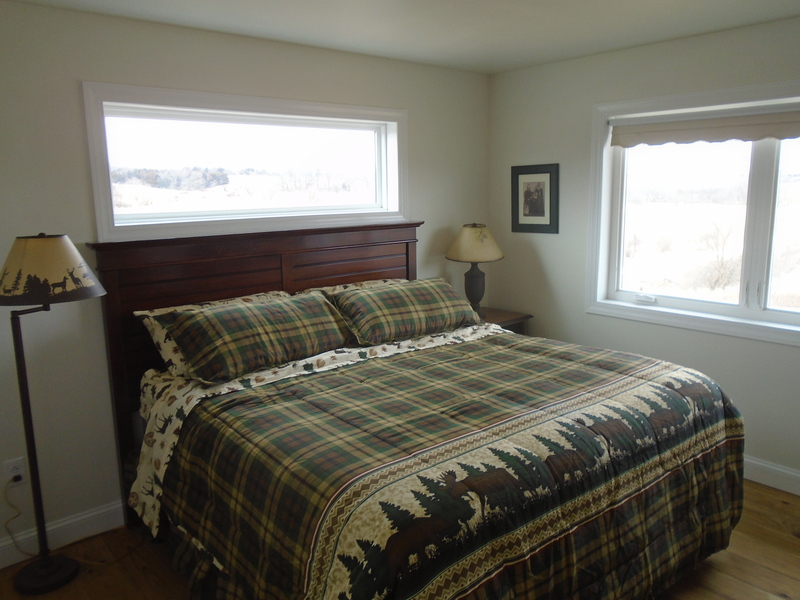 Master bed and bath still has a way to go.